In 1968 Nixon campaigned for the presidency under the slogan that he would end the war in Vietnam and bring “peace with honor.” The war had pretty much chewed up the Democrats by then and Nixon was elected largely on his promise of de-escalation. However, no such plan really existed, Nixon actually escalated the war by taking the fight to Cambodia, and the American commitment tragically continued for years. The center piece of the tactic was a program known as “Vietnamization” wherein the American public was told that military fortunes were improving, that victory was achievable, it was only a matter of showing patience. The war managers told us our troops needed more time to gradually build up the strength of the South Vietnamese Army (ARVN), to re-equip them with modern weapons so that they could defend their nation on their own. This policy became the cornerstone of the so-called “Nixon Doctrine.” When the US troops finally began to withdraw in 1973, after training and arming the South Vietnamese for over a decade, ARVN fell like a house of cards to the Peoples Army of Viet-Nam (PAVN)—the North Vietnamese launched their third general offensive (the Ho Chi Minh Campaign) in 1975, and toppled the Saigon government in crushing fashion. So, why did the South Vietnamese army fail so miserably when left to stand alone? After so many years of training, and in possession of superior American-made firepower, how is it that they appeared to have never stood a chance? 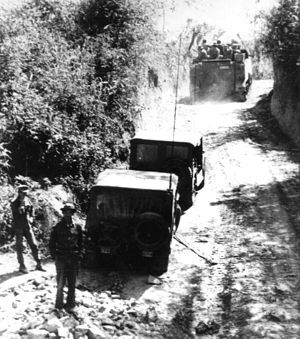 History reveals that the South Vietnamese (ARVN) forces may have contained the seeds of their own demise– they were probably doomed from the start, way back in 1955.